Rural Nations (Scotland) CIC is an artist led production company based in Stornoway which commissions film, experimental theatre and strategic arts projects. Working across a broad portfolio of arts initiatives Rural Nations CIC delivers the annual Hebrides International Film Festival and produces our own Island originated professional theatre and short film projects in partnership with artists and organisations based across the UK and from other countries. Currently we are working on the development stages of a new environmental theatre show Wild looking at Golden Eagles and our relationship with wildness. The piece delivers visual theatre / puppetry by Muriel Ann Macleod and storytelling by Alex Patience (Portskerra). Our film work is focussed in 2019 on the production of a short drama around Iolaire survivor guilt, based on true Island stories, we are working with award winning Scottish screen writer Jim McRoberts and currently building an international film crew to deliver the work. The Gaelic language short film which is in the process of seeking funding is being created for international Film Festival markets. Keep an eye on this website for more details over coming months. The company is also working on a new phase of research and development where we are looking at digital innovation using theatre and storytelling presented in the context of extreme environments and virtual space. 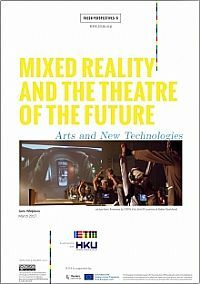 The IETM Fresh Perspectives series takes you on a playful but serious journey along the issues at stake when designing a mixed reality experience in the context of theatre and performance.